For your consideration is a Vintage Tiffany & Co. Paul Revere Reproduction .925 Sterling Silver Baby Cup in excellent pre-owned condition. This baby cup shows some light wear and features an original design by Paul Revere reproduced by Tiffany & Co. crafted in fine sterling silver. 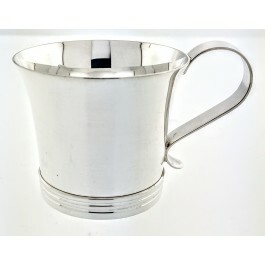 Overall condition of the cup is very good with minor light marks on the outside of the cup, an original polished and brushed finish and no monograms. Two light dings appear at the edge of the base but are mostly superficial. Cup measures 3 inches from the outer edge to the end of the handle. Diameter at the top opening measures 2 1/8 inches. Base's diameter is 1 5/8 inches. Height is 2 inches. Weighs 52.6 grams. Please view our photos for additional information.